There are some problems using Firefox in Kubuntu. The menus are ugly and do not use the KDE style. The file browser for uploading or opening files is also ugly, and is not the default KDE mini-file-browser. The filetype icons are not shown correctly in the Downloads window. In the small Downloads window, if I right-click a file and select "Open Containing Folder", nothing happens. gtk3-engines-oxygen is installed and "oxygen-gtk" is the default GTK style in System Settings > Application Appearance > GTK. Something tells me I am missing something to integrate Firefox into KDE. What can I do to get Flamewolf - ahem Firefox to integrate nicely with KDE? This will lead to a better experience, as shown in the picture from Martin's blog post. 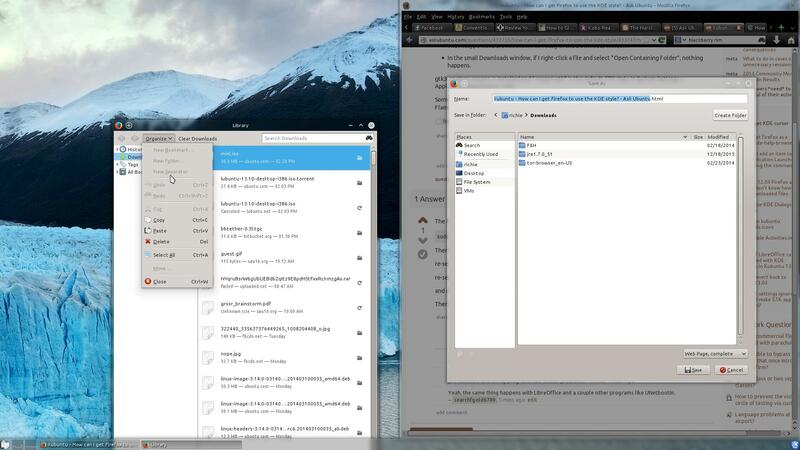 The reason this is not installed by default in Kubuntu is that Kubuntu tries to maintain a "pure" KDE experience, and therefore rarely alters upstream packages. And since Firefox is not a KDE application, upstream (KDE) would have no interest in supporting Firefox. This is the best answer for how to handle integration with Firefox + KDE in Kubuntu. Editorial: If more people file bugs on the matter, maybe it can be addressed. Esp. since Firefox is the default browser now for Kubuntu 14.04, which is a LTS. The first thing when you install KDE Distro is to install gtk3-engines-oxygen. Then every program include Firefox should appear correctly. Not the answer you're looking for? Browse other questions tagged firefox kubuntu kde or ask your own question. How can i set exceptions for Metacity/GNOME window-styles? How do I get rid of the Ubuntu scrollbars and theming in Firefox 46.0?